Yes, you can arrange to have a delivery received and stored safely until you can come and retrieve it in person. We can arrange for your goods to be stored to be collected by a denominated person/company as well. Terms and conditions and charges may apply so please liaise with the store for additional information. No, it doesn’t as insurance depends on the full new replacement value of the goods you are storing. If you need more information about insurance, please contact the store. Do I have to take out Robinsons self-storage insurance, or can I use my own insurance? You can take your own insurance but you must ensure that it covers good placed in self-storage as not all household insurances provide this cover. You will need to provide us with proof of your cover upon signing your Customer licence. Proof will need to state that it covers goods stored in a self-storage facility, name our store and our full address. It is your responsibility to keep your insurance documentation valid and up to date. Can I upsize or downsize my storage space? Yes, you can. You will just need to liaise with the store and provided we have the availability, you can move to a smaller or a bigger storage unit. You will need to sign a new Customer licence and move your goods to your new storage unit. Yes, you can but we strongly advise you to check with the store that they are suitable for use. Alternatively, you can purchase a suitable padlock at the store. Which size storage unit will I need? To help you choose the right storage unit, go onto www.robinsonsrelo.com/self-storage and look at the illustrations and pictures available for each storage units. If you have any additional question, please get in touch with the store. We have 8 sizes: 15 sq ft, 25 sq ft, 35 sq ft, 50 sq ft, 75 sq ft, 100 sq ft, 125 sq ft and 150 sq ft. Yes, there is: we have a full sized passenger/goods lift, ramp access, full washroom facilities and emergency alarm/call assistance switch. Please liaise with the store for additional information. Is there CCTV in my storage unit? No, our CCTV covers exclusively the entrance, the exit, all the corridors and the parking area. However, each storage unit has its own alarm. Is there anyone to help me load/unload my vehicle? Please contact the store in advance to see if anyone is on hand to help. Yes we do have a goods and passengers lift with a weight limit of 2000 kgs. Yes, we do have several small and large trolleys, which you can find by the loading bay when not in use. Do the storage units have lighting? All our 125sq ft and 150 sq ft units have individual lighting. Please contact the store for more detailed information. Do the storage units have electricity? No, there is no electrical points in our storage units. Customers must sign their own contract. However, if you are unable to be on site on your move in day, you can nominate someone else to act on your behalf. We will ask you to provide us with a signed letter confirming that you authorise the denominated person present to act on your behalf. The denominated person present will be required to provide a photographic ID such as a driving licence or passport and proof of address such as a utility bill or bank statement dated within the last 3 months. You remain the person named on the contractual agreement and will retain responsibility for all future payments. However, you are still required to sign the Direct Debit mandate, but we can send it to you to be completed and returned to us once signed. Can I change my move in date once I have reserved my storage unit? Yes, you can, You need to contact us and let us know your new move in date. Which identity documents do I need to bring for verification? You need an official document with your photograph such as passport or driving licence. If you are a business customer and a company director or senior manager, please also provide proof of your position such as a business card or a letter from Companies House. If you are a business customer but are not the company director or senior manager, please provide a letter from the business to confirm that you have the authority to sign the Customer Licence on behalf of the company. How old do I have to be to hire a storage unit? Do any of the storage units come with shelves? No, but we can arrange it upon request. Terms and conditions and charges may apply, so please liaise with the store for additional information. Yes. Free parking is provided to all our self-store customers. No. Your Direct Debit date is set to start from the day you sign your Customer Licence, and will then continue every 4 weeks from this date. Do you deliver the boxes and packing materials? Yes we do. Terms and conditions and charges apply, so please liaise with the store for additional information. Yes, we do. We sell cardboard boxes, tapes, bubble wrap, scissors, protective covers and dust sheets, padlocks. Do you have to have storage to be able to buy boxes? No, you don’t. Just come to the store and purchase the packing materials you require. You need to give us 7 day notice either by mail or email. You will need to leave the storage unit in the same condition it was when you moved in i.e. clean and clear of any items and with the padlock removed. Can I leave early even if I have paid up front for long term storage? Yes, you can leave early. You will need to give us 7 day notice either by mail or email and we will refund you on a pro-rata basis, as per the terms and conditions. Your storage contract rolls over, and you will be charged for the next 7 days storage. Do I have to clean my storage unit out? Yes, as per our terms and conditions. You need to leave the storage unit in the same condition it was when you moved in i.e. clean and clear of any items and with the padlock removed. Yes, you can. You need to provide you name, contact details and the number of the storage unit you want to vacate. Robinsons self-storage insurance covers customers against general normal perils such as fire, flood or malicious damage. For detailed information, please read the terms and conditions. No. Robinsons self-storage insurance is specific to the goods customers are storing, not the type of customers. Yes, it is. As per our terms and conditions , customers must provide proof of insurance cover for the goods in self-storage or take out our bespoke insurance to validate their contract. How much is the Robinsons self-storage insurance? The insurance depends on the full new replacement value of your goods if you had to buy them again today. The cost of Robinsons self-storage insurance starts from £3.50 per week for £2,000 of cover. Please get in touch with the store for more detailed information. As per our terms and conditions, payments must be by credit or debit card if not paying by Direct Debit. You can use our online payment platform to pay your bill. No. As per our terms and conditions, payments must be by credit or debit card if not paying by Direct Debit. As per our terms and conditions, it is not allowed to store the following items in your storage unit: food or perishable goods plants; birds, fish, animals or any other creatures; combustible, flammable, explosive or oxidising materials; liquids or gases e.g. paint, petrol, oil, cleaning solvents, gas cylinders, cellulose nitrate film, fireworks; firearms, weapons, ammunition, explosives or the components thereof; chemicals, radioactive materials, biological agents; pollutants, toxic or hazardous materials or contaminated goods or other materials of a potentially dangerous nature; any item which emits any fumes, smell or odour; any illegal substances, illegal items or goods illegally obtained, including counterfeit goods, illicit (smuggled/counterfeit) tobacco, illicit alcohol, unlicensed medicines, unsafe goods (including toys, electrical items, cosmetics, fireworks); compressed non-flammable gases without our written consent and in accordance with our specific requirements; any item of high value requiring specialist storage (including without limitation jewellery, money, bullion, deeds, bonds, securities, stamps, antiques, fine art or fine wines; tyres, asbestos; waste materials including any materials or goods for export deemed to be waste e.g. used electrical equipment (unless tested and certified for re-use), used vehicles or parts thereof. You can only store sealed tins. Please contact the store for additional information. Can I store a motor vehicle? Prior to putting motor vehicles in your storage unit, you must drain them of any flammable fluids off site (such as oil and fuel), and their battery must be disconnected. For additional information, please contact the store. Can I store a fridge or freezer in my storage unit? Yes, you can provided the appliances are turned off, de-iced and thoroughly cleaned (to prevent mould). Will Robinsons self-storage help me pack my storage in my unit? No, we don’t provide this service. It is your responsibility to move your items to/from your storage unit. Free trolleys are available from the loading bay. Do you provide free use of trolleys? Yes, we have several trolleys available in the loading bay. Please return the trolleys back to their designated area once you have finished using them. Can I use more than one storage unit? Absolutely. You can rent as many storage units as you require. Can I drive up to my lock up? You can drive up to the loading bay and offload the items onto our free trolleys. Can Robinsons self-storage get rid of the storage items I don’t want? No, we don’t offer this service. However, you can use the Drayton recycling centre nearby. What happens if I lose my padlock key/forget my combination? We can cut your lock off should this be necessary – don’t forget to provide a new padlock to secure your storage unit afterwards. There is a £10 charge for lock cutting, or it is free if you purchase a new lock in the store. We offer a key holding service as well. Please contact the store for terms and conditions. Our store has a 24 hour digital security with a twin alarm systems (one on the building and one on your individual storage unit). There are fire and smoke detection systems throughout the whole building. The quote includes the storage costs only. 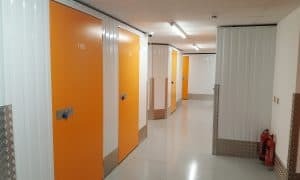 For detailed information on our storage units and their pricing, please visit www.robinsonsrelo.com/self-storage or call the store on 01235 55 22 77. Does the quote include removals? No, the quote is for self-storage only. We can provide removal services, but these are subject to additional terms and conditions and charges, so please get in touch with the store for detailed information. You will receive a reminder and we will contact you to settle the payment before it becomes a problem. If however you do miss a payment, we will allow you 10 days to settle your outstanding amount. After this time you will be charged a late fee, your storage unit will also be locked by us and your entry code temporarily disabled until the account is settled. You will be informed in writing when this takes place, as per the terms of your Customer Licence. We will be in contact to inform you of any further developments if the account remains outstanding. How do I make changes to my account including my Direct Debit details? Any change must be made in writing. Please liaise with the store for any additional information. Yes, customers are required to pay a refundable security deposit (equivalent of 4 weeks storage fees, no VAT) before storing. We only accept payments every 4 week. You can pay in advance for longer licence agreement, but please liaise with the store for additional information. Do you offer a collection or delivery service? Yes, we do. The service is available within 10 miles of the store and additional fees apply. For more information, please liaise with the store directly. Is there Wifi or a phone line in the storage units? No, there is no phone line nor Wifi in the storage units. The contract is open-ended so you only need to inform us if you want to move out of your storage unit. Please note that we have a 1 calendar week notice policy. The minimum length of stay is 1 calendar week. As the notice is 1 calendar week as well, you would need to give notice on the date you move in. The only persons who can access your storage unit are the ones you have granted permission in your account details. You will have to give them your access code and the key to your padlock. Our self-storage facilities are opened Monday to Friday between 8am and 6pm, Saturday between 9am and 5pm and Sunday between 10am and 2pm. What do I do if I’ve forgotten my PIN entry code? For security reasons, you will need to contact the store directly on 01235 55 22 77 and the store manager will take you through some security questions in order to confirm your identity, and re-issue a PIN entry code. Access during opening hours is free of charge. Yes. As long as you have been given authority to store them in your storage unit on behalf of their owner. You are solely responsible for allowing designated people access your storage unit. Each individual must be named on your account and in possession of both your access code and the key to your padlock. Yes. They would need to be named on your account and be in possession of both your access code and the key for your padlock. Can I use electric appliances in my storage unit? No. There is no socket in the storage units.